This post was inspired by a recent post over on Dinged Corners. The debate going on over there is about the statements about authenticity that the card manufacturers put on the back of their relic cards. I have bought a number of relic cards over the past few years because, frankly, they are dirt cheap on eBay. The earliest relic cards I own are from 2000. Most cards in the 2000-2005 time frame that I have have statements similar to this 2000 Absolute Memorabilia Rookie Premier Materials. "The enclosed piece of pant was cut from Authentic Pants personally worn by Josh Beckett in an Official Minor League Baseball Game. The Authentic Game-Worn pants were obtained and are guaranteed by the Playoff Corporation". That's pretty straightforward. 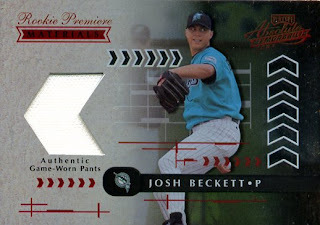 Josh Beckett wore these pants in an official game and we determined that this was so. 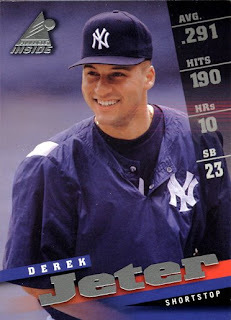 But even then there were some cards which had vaguer statements, like this 2001 Bowman's Best Franchise Favorite Relic. Congratulations! You just received an authentic game-worn Franchise Favorites uniform card of Craig Biggio from 2001 Bowman's Best Baseball." Did this piece of fabric come from something actually worn by Craig Biggio? That's certainly the impression. They clearly say it came from a uniform worn during a game, but was it an Official MLB game? This 2003 Fleer Box Score World Piece Game Jersey card has more odd language. 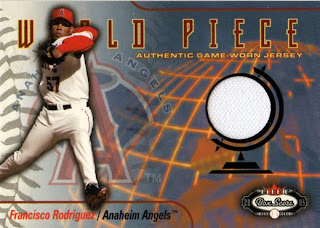 "The piece of memorabilia contained in this card is from a jersey worn in an official MLB game played by Francisco Rodriguez pitcher for the Anaheim Angels". Ok, the jersey was worn in an official MLB game and Rodriguez played in the game. Did he wear the jersey? I'll concede that a player probably wore the jersey, rather than a fan or a member of the grounds crew, since it didn't say "worn at an official MLB game". The wording started to change dramatically in 2006. Only about half of the 15 relic cards I have from 2006, specifically say that the player pictured actually wore the jersey. I have over 40 relic cards from 2005, and 32 of them say the relic came from a uniform specifically worn by the player pictured. 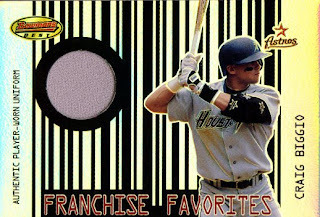 Then we have this 2006 Bazooka Rewind Relics card. "The relic contained on this card is not from any specific event, game or season." You might be lead to think that the relic was from a Future's Game, but the disclosure on the back makes it sound like probably not. The wording reaches new hights of weasel wording on this 2006 Flair Showcase Stitches card. "You have received a Richie Sexson Game-Used baseball card. 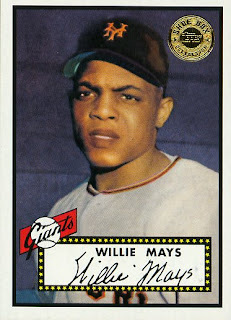 On the front of this card is a piece of memorabilia that has been certified to us as having been used in an official Major League Baseball game". Did Richie Sexson wear this jersey or whatever the piece is from? What is the difference between used and worn? I could imagine that this was from a rag used by the clubhouse guy to wipe down the dugout benches before the game. And Fleer completely disavows claiming authenticity of this piece. Hey, we were told it's authentic. I have 17 relic cards from 2007 and 13 from 2008, of these, only 1 from each year makes any claim that the relic came from a uniform actually worn by the player on the card. 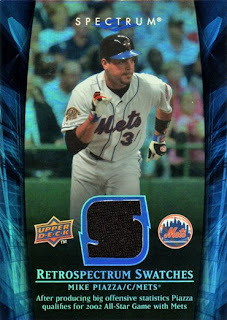 Pretty much the language looks like that on this 2008 Upper Deck Spectrum Retrospectrum Swatches card. "You have received a Mike Piazza Game-Used baseball card. On the front of this card is a piece of memorabilia that has been certified to us as having been used in an official Major League Baseball game". Which is the same language on the 2007 Fleer card. The 9 Upper Deck relic cards I have all have the same language. My Chris Capuano Topps Retail Relic, is the only card to make a specific claim, which says "The piece of authentic uniform embedded in this card was worn by Chris Capuano during an official MLB game". In 1993, the Ted Williams Card Company produced a set of rather unique items. Anyone remember "pogs?" 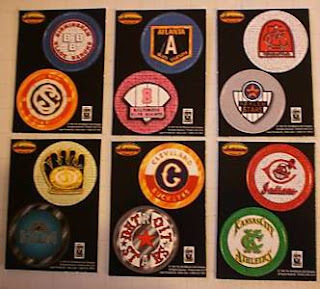 Pogs were the thing to have and collect in the early 90's, a throwback to the milk caps kids played with the 50's or 60's or whenever it was that "Wii" meant either something was tiny or one had to use the facilities. In any case, the were little round discs. 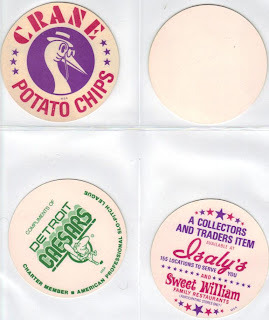 What the TWC did was to print the circles on cards, then have the cards die-cut and perforated so that one could punch out the pogs. You can't see it in the scan, but there was a thumb-like indentation on each pog. I have no idea how to play the game, other than you stack a bunch up and try to knock down the stack with your pog. Like a cardboard version of a cross between marbles and Jenga, I guess. There were twenty-six pogs in all. 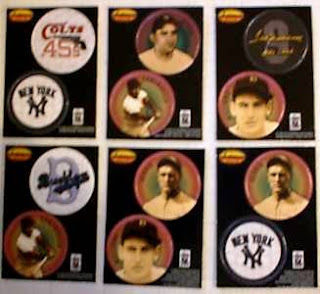 Some featured vintage team logos and other featured players such as Yogi Berra, Lou Gehrig, and of course Ted Williams. These were laid out two to a card and could be found as inserts in the 1993 Ted Williams baseball card packs. Like many of the oddball items in my collection, I have no idea how I came about these little gems. I'm sure they were bought online, but just how I even found them is a mystery for another time. 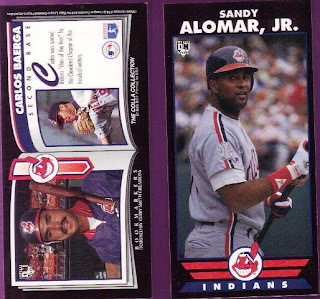 These are 1993 Diamond Marks baseball cards, er, bookmarks. They are long and skinny (much like I was 20 or so years ago). The feature the player's name at the top, a nice, big photo, then the team logo at the bottom. There is also a DM logo in the upper left corner of the player's picture. The back features a "book border" with a couple more player pics, a team logo as its own bookmark, and little blurb about the player on the right-hand 'page.' 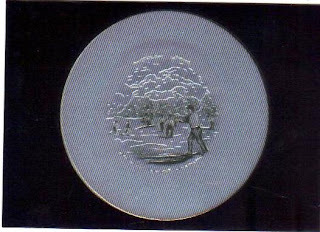 There are also various other company IDs: The Colla Collection, (c)BCP, and "designed by Terry Smith Creations." Since Colla put out all kinds of oddball/non-mainstream cards, I'm sure it is safe to assume the pictures came from their photographers. In a recent trade to a chap in the UK, I received several packs of 1995 Phil Rizzuto Chromium cards. Now, before you think I've lost my mind by posting this here about a week after posting about these over at A-Pack-A-Day, I urge you to keep reading. Here are two normal-looking cards. They are "chromium" and colorized. Some people think there's too much 'foil' on cards today, but long before Topps Chrome (well, maybe not LONG before), there were these gems. All Chrome, All the time. The cards feel a lot like Topps Chrome, in fact. They have that same slick 'covering' to them. Pictured above are Forbes Field (Pittsburgh) and Briggs Stadium (Detroit). The next card has a blue back. The other cards have a 'vintage' back, kinda like sepia maybe. This card is also devoid of the 'coating,' which gives it a whole different feel, almost like a map relief. 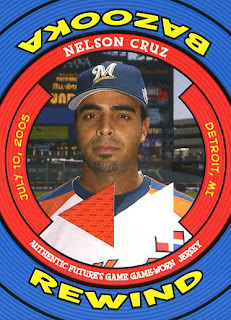 The card depicts "Bunting," in case you couldn't tell what was happening here. Though, you can see the batter clearly missed the bunt big time. ooops. 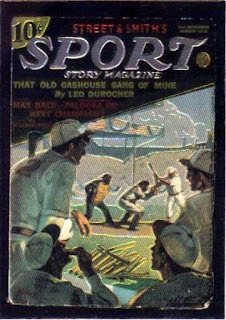 Here's another two-fer: A baseball card that features baseball on a cover of "Sport" magazine (I feel the need to reference "Con Air" here and specifically to the "Define Irony" scene). The back talks about the magazine publisher and the 'zine itself. Okay, this one was included because, well, she's a cutie. Funny thing about 'cuteness' or 'beauty' is that it really is timeless. 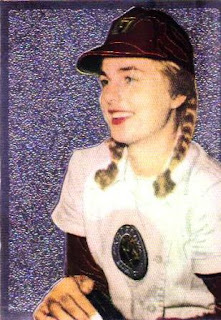 This is a picture of an unknown woman in the 40's who played in the pro women's league for the Ft. Wayne, Indiana, "Daisies." And, finally, I leave you with another type of die-cut on a card. These were developed by/for the Spadling sporting folks - yes, as in the Spalding gloves, balls, etc. According to the back of the card, there were also football, golf, tennis, and cycling die cuts. Cycling? Man, how big was THAT thing!? For my first post on Things Done to Cards, I want to share a card that has kept my interest for over a decade. I pulled this furry little guy from a pack of Circa back in '97. 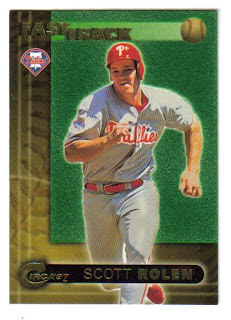 I am pretty sure I got a Scott Rolen card in EVERY pack I opened in the late '90s. I guess I was lucky to have pulled this card. This particular insert was seeded one in every 24 packs. The Fast Track insert set is a nice departure from the train wreck of the base set. It is a nice looking card, and they certainly did a cool Thing to it. The green, flocked surface was designed to look like AstroTurf. Raised slightly above the surface, the "grass" feels like velvet. Unlike my other "valuable" inserts and Tony Gwynn cards, this card never went into a plastic sleeve, top loader, or Lucite screw down. This card was made to be touched. Even if Scott became the next Mike Schmidt (as the back of the card suggests,) the money this card might bring on ebay could never buy the joy received by sliding one's fingers across the furry surface. ... .- -.-- / .... .. / .. -. / - .... . ... . / -.-. --- -- -- . -. - ... / -... . ..-. --- .-. . / .- -. -.-- --- -. . / .--. --- ... - ... / --- -. / .- / -... .-. .. . ..-. / .. -. - .-. --- -.. ..- -.-. - .. --- -. / --- -. / .--. ..- -. -.- .-. --- -.-. -.- .--. .- .. -. - / .- -. -.. / -.-- --- ..- / -.-. .- -. / .... .- ...- . / .- -. -.-- / .... .. - / ..-. .-. --- -- / -- -.-- / -... --- -..- / --- ..-. / .- .-.. .-.. . -. / .- -. -.. / --. .. -. - . .-. This was a very classy move, I think, even though I'm not a Red Sox fan. If you click on the images (showing the front and the back) you can see some of the nice touches, including the fine print on the border of the front denoting all the special accomplishments of the team during the streak period. The ticket measures 8" long and it's printed on thick glossy stock. All in all, a very nice freebie! This is a 1935-ish Diamond Match Company match cover. There were many of these produced from about 1935-1937. 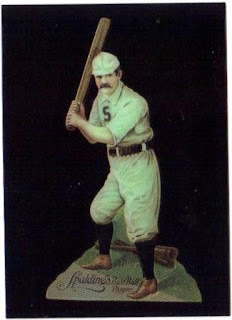 While doing research for this post (which did not net many historical results for my purposes), I came across a site that has a few photos and plenty of stock: Baseball-cards.com. 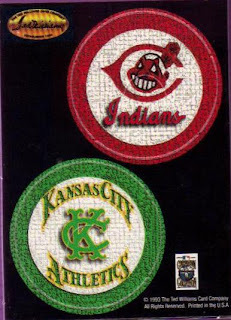 I also came across a site dedicated to the hobby of collecting match covers: MatchCovers.com. These are very cool vintage items. I paid about 10 bucks for the one above, but you can find others cheaper if you look around. The cover itself features a picture of the player on the cover, then bio and statistical info on the back (along with the striking strip). The matches had been carefully removed prior to my getting the item. I'm looking forward to adding more Indians to my collection of these (well, does ONE make up a collection??). This classic Hall-of-Famer made it off of eBay and into my collection last week. The famously-named Dizzy Dean served as the strikeout ace of a St. Louis staff for their depression era team, the "Gashouse Gang." Most of their players came from blue collar backgrounds and sensibilities. Prior to the widespread use of oil, "gas houses" refined coal for fuel and people who worked in them smelled predictably bad. 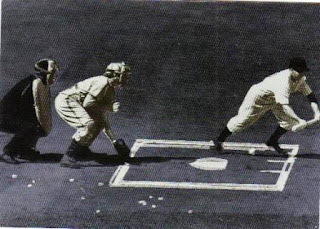 According to contemporaries, the Cardinals often played in unwashed uniforms to give their opponents a similarly imposing snootful on the field. 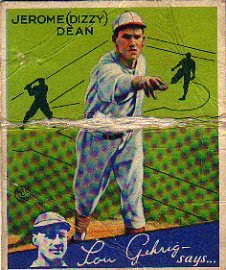 The 1934 Goudey set updated its look somewhat from 1933 by adding a baseball diamond to the background and a banner endorsement from Lou Gehrig (in blue) or Chuck Klein (in red) along the bottom edge. It's not clear why they went with two players instead of one, though I've read a contract snafu played a role. Another eccentricity is the lack of Babe Ruth, who played for the Yankees in both 1933 and 1934, but doesn't appear in this set after chalking up four different cards the previous year. 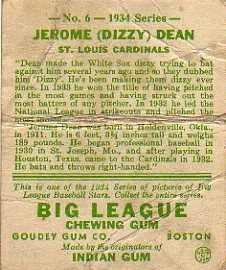 Dizzy's card back retells the origin of his nickname, one that naturally flowed into his second career as a hickish, language-challenged sportscaster. He received flak for chopping words and fumbling meanings, but also turned out gems at a regular pace. See the "official site" of Ol' Diz for more potent quotables. 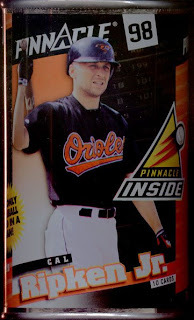 In 1997 and 1998 Pinnacle produced cards which they sold in a collectible steel can. You actually had to use a can opener to get the cards out. There were ten cards in the can (they were packaged in clear cellophane) and the can cost $2.99. There were 24 different players featured on the cans. Checking on eBay I see, you can buy any number of the cans for a buck. I've got 8 of these (one from '97, the rest from '98). Although they are 10 years old, they've held up well, by which I mean they are not rusting. 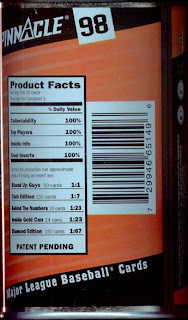 On the back of the can are Product Facts giving "% Daily Value"
The rest of the product facts give the odds on inserts: Stand Up Guys (1:1). This was a two piece thing with slits cut up the center of the pieces. If you slide the two pieces together it would stand up! On each interior face a different player could be seen across the two pieces. I hated these. Club Edition (1:7). This was a gold Dufex finish version of the base set. Behind the Numbers (1:23). I don't have any of these. Inside Gold Can (1:47). I don't have any of these either. It says this is a can. Was the inside of the can gold plated? Diamond Edition (1:67). None of these either. On the side it says "The Only Baseball Card in a Can"! The cards were ok. They were glossy with silver foil on the logo and player name. There weren't many subsets, just a rookie subset and checklists cards with a player featured on the front. Ultimately, I didn't really like the cards which is why I don't have many of them. I think I've seen the cellophane packages recently in repacks. And as a collectable, the cans are a pain in the neck. They are about 4 1/2 inches tall and a little wider than a card. I've got mine in a box in the closet. I already had the Ripken can scanned (that was an adventure). I pulled out the Scott Rolen can to look at details. I'll probably leave it on my display shelf with other Phillies stuff. There were also variations of the cards that already had "coins" in them, which were really just foil inlays. These came in Bronze, Silver, and Gold. But, really, we wanted the actual COINS! 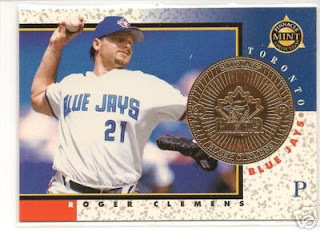 Here's a Junior card with coin, available on eBay for about a buck. There are few cards that I am aware of that were so widely licensed as the 1976-77 MSA discs. They are often referred to by the "issuing" company rather than MSA itself, which makes collecting them even harder than the usual card issues of the time. As you see in the pictures below, some companies simply used stars, while others actually printed the name of the 'issuing' company (such as Crane potato chips). The backs of these cards takes collecting to a whole new level of obsession and insanity. Crane features their logo and company name while others have their own logos and info on the backs. Of course, some don't have anything back there at all (hence, they are referred to as "blank backs"). 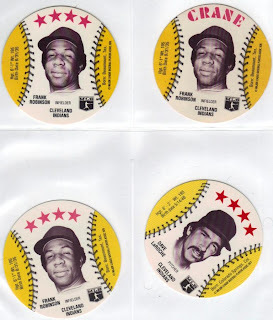 As you see above, I have three Frank Robinson variations, and this by no means encompasses every possible MSA Robinson disc. In fact, this probably doesn't even scratch the surface. I am very partial to the Isaly's card because we actually had an Isaly's near where I grew up as a kid in Western PA. For the record, they had the BEST chipped ham in the world. If you have never had chipped ham (also called chipped-chop or chipped-chopped ham), you are seriously missing out on a delicacy! Put it on your list of things to eat should your travels ever take you to Pittsburgh or close by outlying areas. If you plan on adding some of these to your collection, be sure to search for them by their issuing company (Crane, Isaly or Isaly's, Caesars, etc) and also search for MSA Disc. They are generally a bargain, and are often sold in lots. Happy Hunting! I came across these two little gems while doing a general search for "Indians Oddball" on eBay some time ago. I had never heard of these before then (I've had them for a couple years now), so I was pretty excited to snag them up. In 1983, Perma-Graphics came up with a regular issue and a "gold card" issue. The cards are modeled after credit cards. I have several other 'credit card' types that I'll post in the future. But for now, let's break these down. The regular issue cards feature a cream-colored border that surrounds a gradient-filled inner border. There's a baseball perched at the top of the inner border, just to let you know that this is a baseball collectible. I have no idea if they dabbled in other sports, but if they did, we can assume they used appropriate icons (volleyball, badminton, curling, etc). 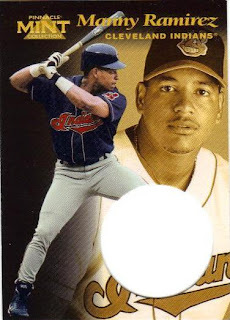 The photo of the player takes up a decent amount of the card face, and is probably the size of a mini sticker like Topps used to make around the same time these came out. Hmm... In fact, on the back, there is a (c)TCG... Coincidence? I'm not thinkin' so. 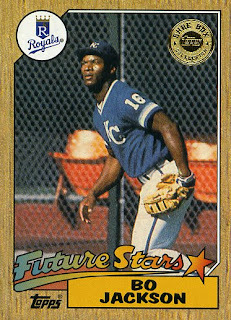 Beneath the photo, the card reads "SUPER STAR" with "1983" between the two words. Then, we have the player's name and team, position, and league. The card may be thickness of a credit card and it feels to be about the same size. The back of the card features a black stripe with the player's name, uniform number, position and team. Below that in a cream-colored box is player bio info with height, weight etc, including how the player ended up on the team he is on currently. Under that are career stats in a single-line table, followed by a section of Career Highlights. Then, there is a white strip where one would presumably sign their name (like on a credit card). The "gold" version of the card is exactly the same as the regular issue, but the whole card has been tinted or layered with a gold/sepia finish. The card, as you can see, is also much, much darker. This is not a bonus, however, as it makes things hard to read. I am going to have to research this whole "certified loyal fan" thing... The ambiguity of the rewards is just too much to bear! I don't know how I missed the "call for contributors," but in all the times I visit here, I never looked over there to see it I guess. I have to admit that I was pretty excited when I got the message that my request had been granted! 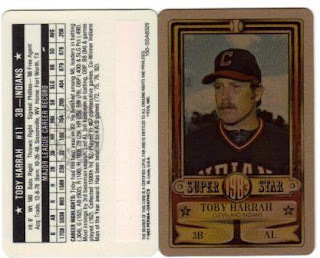 If you don't know me from my own Indians-related card blog, then you are blissfully unaware of my penchant (obsession, maybe?) 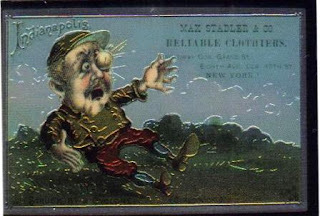 for oddball cards and gimmicks. What better way to share that than right here on TDTC!? Of course, the question ran through my head: What should I write about first? I could go with Doug Jones and the infamous 'flaming ball' card that has become something of a running joke with those that have become accustomed to my postings. But, I decided that needed a break. And then it hit me... Since I am knee-deep in a scratch-off tournament on my site, why not carry that over here? And, so, my first TDTC post became "The Scratch-off." I have two types in my personal collection that I could locate readily, though there may be others I didn't see while flipping through pages and pages of two 3-inch binders jammed with lovely oddball cards. 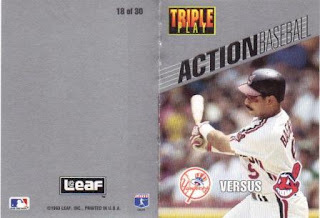 The first one I want to talk about is the same set that I am using for the tournament: 1993 Leaf Triple Play Action Baseball. Each card is actually a larger card that has been perforated and folded in half. It's a lot like one of those fold-up greeting cards you or your kid (or spouse) might print on your inkjet. The 'cover' features two teams who will face off in scratch-off action. Luckily for me, Carlos Baerga is featured on Number 18. There are 30 cards in the set, and you can readily pick up complete (or near-complete) sets online for the cheap. The 'back' of the card features the card number and various logos. The cards themselves have a silver finish to them and feature a white border. 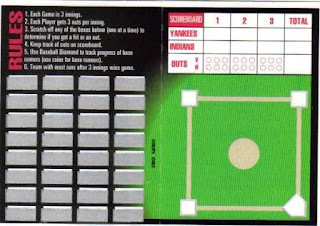 On the inside of the card, we find the RULES (3-inning game, each player gets 3 outs, players take turns scratching spaces, etc...) and the 32-spot playing field on the left side. The right inside features a mock-up scoreboard with the team names and a place for would-be players to record outs and runs. Scratch-off spaces uncover plays such as strikeouts, fly outs, groundouts, walks, singles, doubles, triples, home runs, and a few others I think. Alas, there are no 'hit by pitch' spots. These are clean games. The baseball diamond on the right side is where one would place coins to represent the runners. Trust me on this, if you play, use coins to keep track! And, really, you ought to go ahead and actually write in the runs, too. It won't take long before things get confusing... Or they did for me while trying to maintain six games at the same time. On the other hand, it sure has been fun! Topps opted not to fold the cards, though each card is perforated, should a collector want to separate them. They remind me a lot of the basketball cards Topps was doing back in the day where you got three on one 'card' and then you'd tear them apart to collect the ones you needed. I digress. The front of each 'section' features the player's photo next to 24 black scratch-off dots. 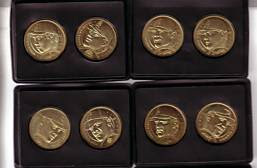 As you can see, these have not been anywhere near a coin. I am torn about that, as I also have a liking for cards in the 'Tipton' condition. The backs of the sections feature different items depending on several factors. The middle card is ALWAYS the scorecard (from what I have seen). The "top" section (when viewed vertically) has the rules. 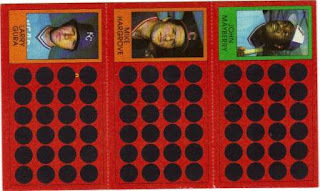 This game is different in that players are to separate the cards into sections in order to build their 9-man batting order. There were/are 108 cards (that is 'sections') in the set. The first player scratches one spot, records the results, then scratches the next batter, etc until the team gets three outs. Then, the other player repeats the process for his/her own cards. I suppose you could play a couple games with each card before running out of space. 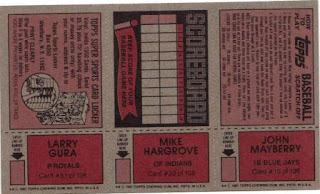 Unlike the Triple Play cards, though, these games go the full nine innings. I cannot imagine trying to do one of THOSE kinds of tourneys online! 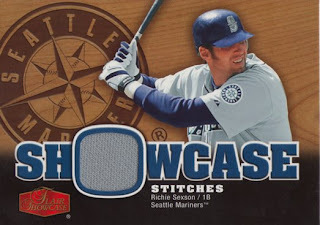 2003 Topps Shoebox was similar to the Topps All-Time Fan Favorites but took the idea to a complete concept. The cards were sold as a complete set and came in a box which was shaped like a shoebox. There were 12 8-card packs, 3 packs for each decade from the 1950s through the 1980s. Each pack came with a generous piece of gum in a plastic wrapper. Inside the box were 4 bays, with the decades separated into separate bays. Sitting on top of the bays was a plastic holder with four original cards, one from each decade, inside. The cards are surrounded by a black frame such that you can see the front and back of the card. The frame is held together by screws. The holder is as long and wide as the box. There was the possibility of getting a rare card in this holder but the best card I got was a 1987 Tom Seaver card that I already had. The frame is wrapped in tissue paper, so when you open the box, it's like you've opened an actual shoebox with brand new shoes in it. The selection of cards is excellent. If you owned the originals of these cards it would be the a great baseball card collection. Most of the cards are either reproductions of rookie cards or, at least, cards from early in a player's career. The reproductions are very good and except for the gold shield on the front and a little strip on the back which gives copyright info, they look like the original cards. That being said, there are some quirks. 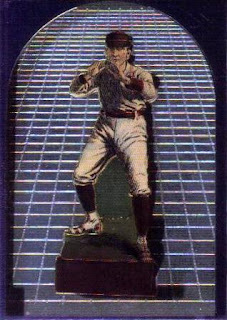 Many player's rookie cards have them appearing with one or more other players. Use the Mike Schmidt card as an example. Schmidt appears with Ron Cey and John Hilton on his rookie card. 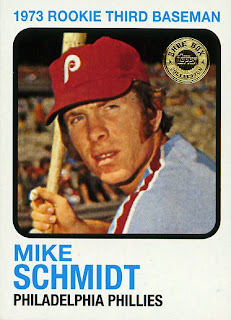 What Topps did for the Schmidt Shoebox card, is to take just the picture of Schmidt and make it into the whole card. This is the one thing about the set I don't like. There are a number of cards from the 1960s and 1970s where they did this. In some cases, the small picture of the player doesn't enlarge well (especially if the original photo wasn't very good) and the Shoebox card looks a bit blurry. Right now, a lot of these cards are being offered on eBay for about a dollar. I paid about $40 for the set when it was new. There are several complete sets, with unopened packs, selling in the $40-$50 range. These are pictured as opened boxes on the auction pages so I expect you won't find a great old card in the holder. My set is missing a card (I don't remember which one) but I got a double. I'll have to look through these auctions to see if I can get my missing card. I've kept the whole set together, including the wrappers, the gum (still in their wrappers), the card holder, the cards and the tissue paper in the original box. I wish that I had been actively collecting a few years ago. 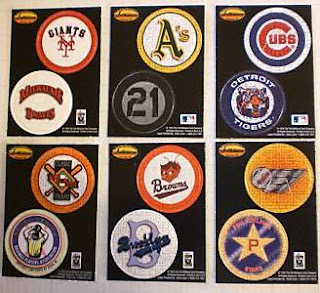 I have discovered these sets that were put out by Topps between 2003 and 2005. While most bloggers who were active in 2005 or earlier know about these releases, the bloggers who just got back into the hobby are discovering all the releases that they missed. The idea is a simple one. Sure, the sets have a few missteps. I'm not entirely sure there's a huge Daryl Boston fan base in Chicago, but who knows, there could be some underground Daryl Boston movement that I'm not aware of in my hometown. For the most part, the selections were inspired. It gave the right mix of retired players, regional stars and superstars. 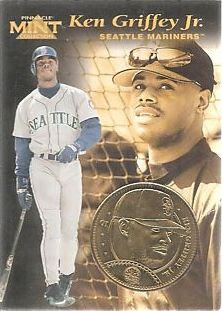 The card designs usually centered around each player's best season. 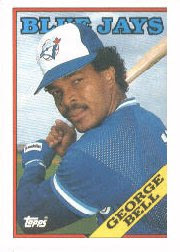 The George Bell card featured his 1988 Topps card. This was the release that celebrated his best year as a player. Ironically, this card looks better than the original card. Sets like these, give the player collector more cards to collect of retired players. They give the team collector a few more cards to collect. They give the set collector something interesting to collect. Since the cards are designed from different years, the set looks like a kid collected his favorite cards and stored them together in random order. It's this aspect that gives this set a leg up on the other cards. 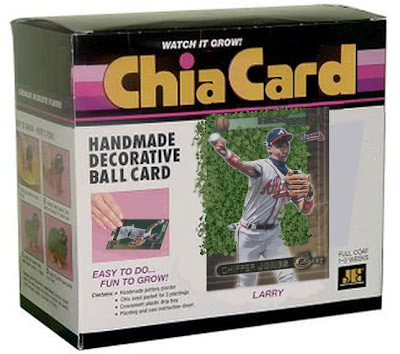 I hope Topps will revisit this concept sometime in the future. I'm sure there are many other subjects that are begging for this type of treatment on cardboard. This would be the perfect set for many collectors to start with. It gives a great overview of Topps trading card history. The set features many players who wouldn't be worthy of a set like UD Masterpieces. Players like George Bell. 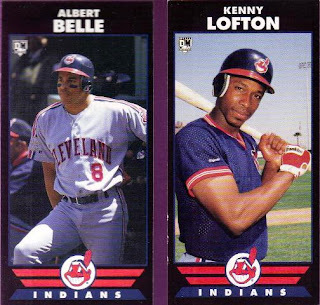 Which 1988 Topps card would you rather have of George Bell? The Spring Training batting pose or the actual game batting shot? Before Greg Brady became a fictional doctor and even before he became the fictional Johnny Bravo, he wanted to become the next fictional Don Drysdale. Shouts of "Bonus Baby" could be heard as he drifted off into daydream land. Fortunately, for the land of television doctors, Greg injured his arm and really got rocked when his head was in the clouds. So, to commemorate lost dreams, I created this card of Greg Brady. I know that the series was on slightly after this card style was made. And I know that he idolized Don Drysdale of the Dodgers. I used the team colors of his baseball team as a template and that screamed Athletics. 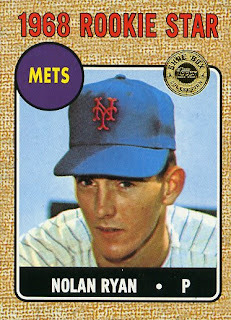 I also figured that the 1966 Topps issue would be around the time he was actively collecting baseball cards, so it would be a design that he could fantasize himself being on. So there you have it. 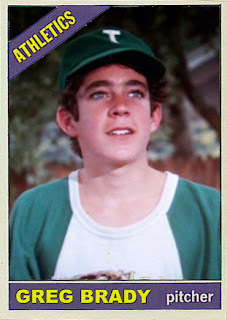 A Greg Brady baseball card. Will the wonders of fake cards ever cease? I sure hope not. I'm a sucker for Mike Schmidt cards. 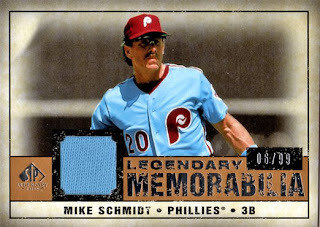 Michael Jack Schmidt apparently remains popular in the hobby as there are a lot of his cards produced every year. I usually try to buy a good sampling of them. Actually I try to buy all that I can afford but am limited by what actually shows up on eBay. The really sharp-eyed will notice that the top card is serial numbered to 99, while the other card is serial numbered to 35. There are 3 other versions of this card, numbered to 25, 15 and 10. I guess each is colored differently although I expect I'll never see one of them. None of them are currently available on eBay.